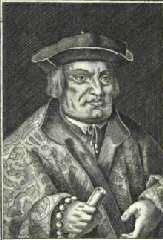 Albrecht, the younger brother of Joachim, the Elector of Brandenburg, holds already the position of Archbishop in Halle but he strives for the archbishopric of Mainz. In this post he will be more than equal with his brother who carries the title of the Empire's Archtreasurer. 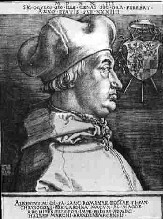 As Archbishop of Mainz, one of the three ecclesiastical Electors, Albrecht has the position of Archchancellor. However, to proceed with this nomination Rome requests all in all 24,000 guilders from Albrecht, a sum the Fuggers (again!) readily advance. To pay off this debt Albrecht agrees that the Peterspfenning (a cent to build the new St. Peter's Cathedral in Rome) be levied in his territories. 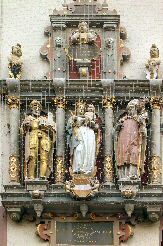 Half of the collected money goes directly to the Holy See whilst the Fugger banking house keeps the other half reimbursing Albrecht's loan. So it happens that a Dominican monk called Johann Tetzel tours the region around Wittenberg in Albrecht's name selling letters of indulgence. Although people rime: When cash rings in the box, a poor soul out of purgatory rocks they readily buy the paper. Squeezing the last cent out of ignorant poor people upsets a young Augustinian monk called Martinus Luther. He not only disputes the selling of letters of indulgence but also protests against the splendor in which the Pope and the whole Church live. In 1517 Luther sends a letter to Albrecht branding him: If you don't stop Tetzel and his practice I shall be forced to show to the world the difference between a bishop and a wolf. Luther's German expressions are crude. He deliberately uses popular language so the man in the street would understand him. Thanks to the new printing technique Johannes Gutenberg had invented in Mainz (sic!) 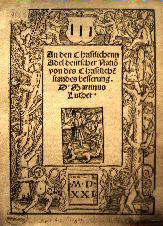 in 1445 Luther rapidly publishes three books that circulate widely. Their titles sound like drum-beats in those times: To the Christian Nobility of German Nation, On the Babylonian Captivity of the Church and On the Liberty of a Christian. These publications set the ball of the Reformation rolling in the Empire. A good part of the German Princes, Electors, Dukes and even the free cities wholeheartedly follow Luther's ideas as the rulers greatly benefit from the new religion confiscating in their territories the rich possessions of the Roman Church. The following map shows how the Protestant religion advanced in Central Europe in the 16th century. 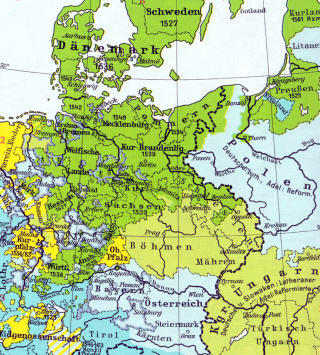 Protestant territories are colored green and yellow. Remained only Catholic (in blue): the three ecclesiastical Electorates (Mainz, Cologne, Trier), Bavaria and the Habsburg possessions like Freiburg. We will not go into the details of the dramatic moments when Luther in Worms in front of the young Emperor Charles V and the Estates emphatically ends his long Latin sermon justifying his faith shouting in German: Gott helfe mir, Amen. All in vain, for the Imperial Diet adopts the Edict of Worms ordering all Estates to return into the bosom of Mother Church. Following his dramatic appearance in Worms Luther who already was anathematized is now outlawed. To protect his Doctor Martinus the Elector Frederick the Wise secretly takes his subject into preventive detention to the Wartburg Castle located high above the city of Eisenach. There Luther, disguised as Junker Jörg, translates the New Testament into his Saxon dialect that will develop into the High German language. The only original Bächle in Freiburg on Markt-Gasse. Contrary to the modern type this one runs in the middle of the street. But what happened in Freiburg during these dramatic years? The city is far away from Wittenberg but Zwingli's reformatory ideas sweep from Switzerland over the Rhine. 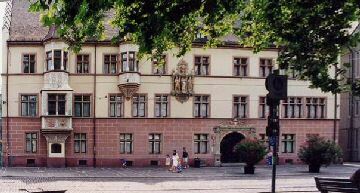 In Freiburg in 1522 many university professors and even the parish priest are rather inclined to Luther's ideas. 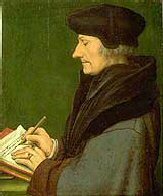 A certain Professor Philipp Engelbrecht writes: So that you may acquire Luther's scriptures, sell all your books, shirts, shoes and pictures. The author of new Laws and Privileges for Freiburg Huldrichus Zasius reads Luther's books with enthusiasm but when the city eventually follows the Edict of Worms requiring all people to return within the pales of the Church Zasius says: I applaud both Luther and Erasmus of Rotterdam but being a good German citizen he adds: we must obey the Emperor. In full obedience Freiburg's City Council decides to burn all of Luther's books and leaflets. 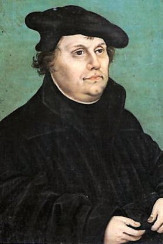 In the meantime the German peasants had completely misunderstood Luther's book On the Liberty of a Christian. Contrary to 1513 when uprisings remained rather local the peasants' revolt of 1525 is nationwide. The peasants forward written demands based on the Holy Scripture including the free choice of their pastor who should teach nothing else than the pure gospel, loud and clearly without any human additions. Their spiritual and military leader is the Che Guevera of Thuringia the radical Thomas Müntzer who insults his former comrade and friend Luther being the soft boiled egg of Wittenberg. The murdering and plundering hordes of peasants roaming the country present a deadly threat to the Reformation as Luther in opposition to both the Roman Church and the Emperor fully depends on the local Princes' support, on a strong alliance between Altar and Throne. So he writes one of his strongest pamphlets Against the Murderous and Thieving Hordes of Peasants and demands the Princes to beat those hard. For Luther the authorities even lead a Holy War against those peasants when he states: We live in strange times where a Prince can gain his eternal life in shedding blood whilst others must pray for it. Before the general riot is drowned in streams of blood several hordes of peasants totaling 12,000 men march from all sides on to Freiburg, the city they hate so much as it still clings to the Papist faith. Once the besiegers had encircled the city they start the exchange of hostilities with modern warfare in writing letters and pamphlets. The sending back and forth of documents between the enemies is so intense that the peasants soon run out of paper. So they demand and the city agrees to trade in paper against salt. Next the peasants still do not shed blood but simply turn off the city's water supply. 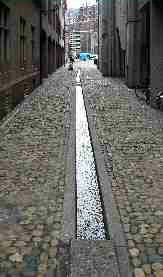 Not only the roadside streams - the Bächle - stop running but the supply of drinking water is cut. This soon results in the surrender of the city. The victorious peasants force the city council to join their Christian Union. This Union has the aim to create an universal peace and to wipe out the rigors they had suffered both from their secular and spiritual masters. Whilst the peasants declare their respect to the Austrian emperor they demand the citizens to pay two Kreuzers per week and house to atone for the protection Freiburg had offered to the Catholic nobility and to church officials. About this development Freiburg's ruler Archduke Ferdinand is not amused and the city falls in disgrace. Once liberated the citizens however more than overcompensate their trespassing. The burning of heretic books is intensified and any fellow citizen suspected to lean towards Protestantism is exiled. Soon Vienna permits the sons of Austria again to study in Freiburg, a privilege Freiburg only shares with such Catholic universities as there are Vienna and Ingolstadt. In 1529 the Reformation goes off course in Basle. Fundamentalists, one would call them nowadays, storm Catholic churches and monasteries and cut to pieces the interior. These iconoclasts not only destroy irreplaceable paintings and sculptures but a whole medieval culture. Horrified the Cathedral Chapter and the great Erasmus of Rotterdam flee Basle and look for shelter in good Catholic Freiburg. 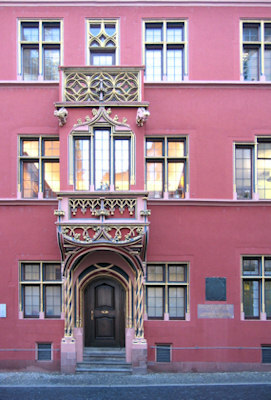 Whilst Erasmus lives in the Haus zum Walfisch, Basle's Cathedral Chapter moves into Konrad Stürtzel's property the now called Basler Hof. The rich residents embellish the building considerably once they had bought it in 1587. Meanwhile all efforts to reconcile the two doctrines fail as the Protestants insist on their rid of Rome. Charles V really is in difficulties. He not only is in constant war with Francis I of France for the Empire's territories in Northern Italy but also has to face the Turks who in 1529 under the command of Sultan Suleiman the Magnificent besiege Vienna for the first time. However in 1530 the tide changes when Pope Clement VII strengthens Charles' position consecrating him Holy Roman Emperor. 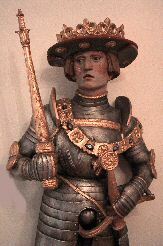 The same year Charles personally convenes an Imperial Diet at Augsburg to force a decision on the religious dispute. 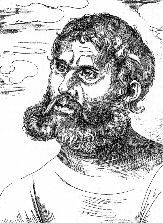 At that Diet Philipp Melanchton, Luther's closest collaborator and full of good hope, presents the Confessio Augustana yet the catholic Johann Eck simply rejects the manifesto of the Lutheran faith in his Confutatio. When the Lutheran Estates leave the Diet under protest (Protestants!) the Emperor and the remaining Estates insist again on the edict of Worms that they threaten to enforce. Still under shock the now named Protestant Estates form the League of Schmalkalden to guarantee their freedom of faith and peace in the Empire. The Emperor cannot yet react but in 1544 Charles eventually gets his hands free when he - after four previous attempts - concludes a final peace treaty with Francis I. Although The Emperor loses the Duchy of Burgundy to the French Crown he still considers himself as the winner. 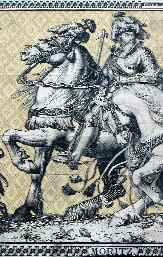 Francis promises to stop his messing around with the Turks and to support Charles in his fight against the Protestants. In 1546 Charles succeeds in bribing the Protestant Moritz of Saxony. The Emperor offers Moritz the Saxon Electorate for his military support. With the help of his new ally the Emperor defeats the League in the Battle of Mühlberg fighting himself as usual at the very front. When he is asked to better take care of himself he shouts back: Do you know of an emperor who was killed by a bullet? As promised John Frederick the Magnanimous loses the Saxon Electorate to his cousin Moritz. Using the inertia of his victory Charles tries to pervert the liberal Constitution of the Empire creating for him and his descendants a monarchia universalis, an absolute monarchy. As compensation he offers to the Estates an Interim in the religious dispute. Again the Protestants are shocked. 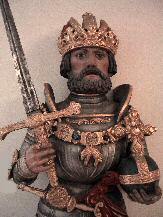 Now the new Elector Moritz of Saxony changes sides again and rebels together with other Princes against the Emperor. To ensure French support against Charles Moritz signs the treaty of Chambord making King Henry of France the Vicar of the bishoprics of Cambrai, Metz, Toul and Verdun, i. e., he trades in Imperial territories. This deed definitively earned him the title Judas of Meißen. To recuperate the lost territories Charles besieges Metz but gives up after three months saying: Luck is like a woman, it only loves the young guys. Charles is just 52. Burned out he abdicates four years later and eventually dies at the age of only 58 in a Spanish monastery. His legacy, the realm in which the sun never set, is divided between his son Philippe II of Spain (1556-98) and his brother Ferdinand I (1556-64) who as Austrian Archduke had already dealt with the German affairs when Charles had been fighting Francis I in Italy. While the Council of Trent still deliberates a reform of the Roman Church the positions of the two doctrines harden. There is no compromise possible. Therefore at the Imperial Diet at Augsburg in 1555 young King Ferdinand I being pragmatic pushes for a religious peace simply proposing to keep the status quo. In a peace settlement the Estates claim the principle of cuius regio, eius religio*. They must however guarantee religious freedom to minorities of the other confession in their territories or allow them to leave the country. *The faith of the ruler determines that of his subjects. In the following years the rest of Europe is in turmoil. In France civil wars are fought between Catholics and Huguenots, the Netherlands are up against Spain, and Sweden battles Denmark, Poland and Russia for the supremacy in the Baltic Sea. The German territories however enjoy 63 years of peace, the second longest peace period in German history so far. During all the quarrels between Charles V and the Protestant Princes the citizens of Freiburg lived without much disturbance. Some people became worried by France's territorial expansion but the Austrian possessions even on the west bank of the Rhine are not concerned yet. Huldrichus Zasius together with other reasonable contemporaries does everything to support the shaky religious peace against the spoilers, provocateurs and those who tacitly try to enlarge their territories at the expense of the other confession. He writes: Avoid those pamphlets as they will only lead to hatred. God rather wants reconciliation and harmony. In the meantime the Reformation in Germany is well established. When however in 1608 the Protestant Estates start a Cold War forming a Union under the leadership of the Prince of Palatine the Catholics feel endangered. 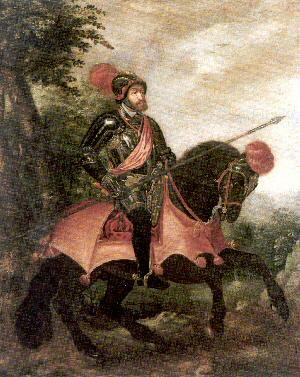 As a reaction the Bavarian Duke Maximilian founds the Imperial League only one year later. The tension further mounts when in 1617 the Protestants celebrate the 100th anniversary of Luther's nailing his 95 Theses. As a reaction the Pope proclaims an exceptional Holy Year. In fact, it needs only a tiny spark to make the barrel of gunpowder explode.